It is a little word, “Ghor”- home. Just say it a few more times in your mind and you will find a little symphony, something very familiar to the heart, something very closer to our roots. Living in the concrete jungle it is hard to remember where we come from. Do you remember the time when you went to your grandpa's house and it was raining for the first time after a long summer? I don't know if you have been lucky enough to have had that kind of experience. A strange soothing smell comes from the soil drenched from the first shower. It's like the mud and soil are expressing the joy of being purified by the first drop of rain. Standing in the little balcony of rural house the dripping of crystal clear water looked like a heavenly phenomenon. But where are we now? A prisoner of concrete kingdom we live our life with in our mechanized apartments. Within this cubicle the cold walls are very close but not that close enough to our hearts to leave our imaginations run wild. “Ghor”- Kachy thakar char deyal, is a unique effort of Sajid-Bin-Doza Bonny, a senior lecturer and international award winning architect. This exhibition is unique because here he searched for the root of our life. Starting from 4th December to 17th December in Alliance Francaise “Ghor”- the 2nd solo exhibition of the artist shows us an astounding endeavor of this young and promising architect to represent the rural house and culture of Bangladesh. “It was started quite long ago when I was working for my first solo exhibition, Sketches of Heritage. Moving all over the country I find out some extreme diversity and unique patters of mud housed in the rural area which surprised me.” And the history of next two years you can find in galley of Alliance Francaise. Combination of sketches of over 26 type of houses and artifacts from the rural area of Bangladesh and 3 intricate models of them are a perfect package including a little hand book containing all the details. With pen and pencil the paintings reveal the perfection of our rural culture and the vivid overly of water-colour gives them life with in the canvas of two dimensions. Among his works Do Mahela, Iskool Ghor, House on High Machang, Lamar para boro Buddha mandir are outstanding with their elegance and sophistication. “A sketch is the authentic language to convey the message to the common people and with the straight reference to it I deliberately selected the media of the exposition, Sketch. 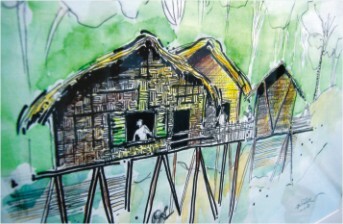 This exposition will provide a bold message to the people of our country to get aware, to retain the natural and the indigenous house from in the rural Bangla, otherwise the beautiful rural house forms will ebbs someday…”- This iss the massage of the artist which speaks louder than the words through his works to all the people of our country. Overall it is a fantastic experience to enjoy his works and to know the extreme diversity of the story of Mud and Thatch of “Ghor”. It all began on the 12th of November. 5 bands performed at their best and at the end it was Circle of The Sixth and Cadaver who took the evening with the former being the audience's choice and the latter the judges'. The second phase was scheduled on the 19th but due to political problems it had to be shifted to the day before. The toughest group of the three. The judges surely had to sweat to pick a winner out of the 5 mesmerizing bands which included Demise, Defiance and Funeral Anthem and also the likes of upcoming talent Embers and Blood Concept. Demise with their extraordinary Warfaze covers gave the show a monstrous opening. Following them were Defiance with their satisfactory performance and then the stage was taken by Funeral Anthem. Their Children of Bodom covers were as always heart throbbing and the main attraction was the curtain raiser of their own track “Onteshtikriyar Stobogaan” which had fiery solos and extreme keys work, tremendous drumming and extraordinary bass and vocals. Embers followed next with their Megadeth covers and following them were the new faces Blood Concept with their thrash covers. When it came to the judgment, the results were loud and clear. As the audience choice it was Funeral Anthem with about half the votes of the total and as Judge's choice it was the underdog band Blood Concept. These two bands thus made it to the Grand Finale and were to face once more. The third phase was as exciting as the previous two. All 5 bands performed at their peak and it was indeed a tough choice for the judges as well as the audience. Finally Trainwreck and Mercinaris made it through to the finals. The grand finale was simply ready to give the crowd one evening of a lifetime. Setting off were Cadaver performing their numbers. The judges, Oni Hassan, the lead guitarist of Warfaze, and Sunny Hassan were pretty much impressed with their performance. Then what happened was simply misfortune. As Trainwreck got on the stage and were checking the instruments, they found out that a drum piece was damaged and had to be replaced. So everyone had to wait for quite some time to see the show running again. Finally the error was corrected but instead of Trainwreck, Funeral Anthem took the stage and what a response from the audience. The front of the stage filled up with just a blink of an eye. They started off with their own track, followed by two Children of Bodom covers and then the extreme power metal track, “Valley of the Damned” by Dragonforce. The judges were praised their fine work commenting on every member with individual reference and went on to even compare the keyboardist with the likes of Jane Warman. As soon as their performance finished, voting started and the crowd started to reduce but nonetheless the show carried on and Trainwreck carried the flow of the show with their thrash numbers. Following them was Mercinaris who also performed with satisfaction. Blood Concept was next to follow and they remained a tight performer as they were in the qualification phase, performing their Godsmack numbers with perfection. Finally the last slot was occupied by Circle of The 6th and they did their Symphopny X and Dream Theatre numbers with victory in mind. After Circle of The 6th left the stage, the judges and the organizers went to a separate room and started counting the votes and take a final decision. Everyone out there was almost biting their nails off in anxiety and excitement. Fifteen long minutes passed and the judges finally came out. Oni Hassan had to leave early for some reason and Sunny Hassan took the stage and gave a speech, and then handed the microphone to one of the Organizers. The mystery could no longer be withstood and the results started to be announced. “The Second Runner-up of MUSIC FUSION 2009 BATTLE OF THE BANDS is Trainwreck… the First Runner-up is Circle of the 6th and can anyone guess who the winner is..?” Every one present started to shout out loud, “FUNERAL ANTHEM”. The speaker waited no longer and screamed out, “Who's gonna bang their heads at your funeral…yes people you are right, with 131 votes it is Funeral Anthem, the champions of the Music Fusion 2009!” Funeral Anthem was then called on to the stage and were handed the cheque of Tk.25000 and requested to deliver an acceptance speech. The evening finally came to an end with Funeral Anthem being crowned the champions and a houseful D'Boulevard is indeed expecting many more events of such caliber in the near future. 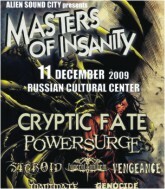 This Friday, Alien Sound City presents Masters of Insanity at RCC had the stage blazing again. Cryptic Fate returning to the music scene after a long hibernation was supposed to have a houseful audience but unfortunately due to a high ticket price it did not come to reality. The show was supposed to start at 3:30 PM and it did but there were no crowd and the first performance by Genocide was as if done in front of almost no audience at all. Slowly people were just beginning to enter the auditorium but nonetheless, the RCC flavour was still missing. Inanimate then gave a good performance but yet again in front of a relatively small crowd and almost without any head bangers at all. Then with a healthy crowd Vengeance took over the stage, with an excellent performance and from then onwards the crowd started to come in. With almost half the RCC usual crowd missing Funeral Anthem still got quite a good support from existing audience, receiving much head banging and moshpit. Steroid then took over the stage and gave a hearty performance after quite a long break. Power Surge, what can be said about them? The D Rockstars winner could pull out the beast from any crowd. The auditorium suddenly looked a little crowded and there was head banging all over the place. An auditionee for the lead guitarist of Power Surge gave a good performance and the absence of their previous guitarist was not felt as much as during their previous gig. With the audience at their feet in front of the stage, Power Surge left the stage announcing the stage to be taken by the headliner of the evening, Cryptic Fate. This band needed no introduction. Their last album, Danob was probably the biggest hit of the year, it was released in. And since then they were hardly seen. Returning to the scenario after such a long time, made no difference to who they were and what they were. Their performance was worth the money spent and the show finally received what the organizers desired. With their melodious tracks and solos and reefs, they had the crowd rocking and all the weary was lost and the expected outcome of their performance was felt with perfection. All in all the show was a good one but with almost half the crowd missing, the real deal of The Russian Cultural Center was missing indeed. Hopefully better shows can be expected next time.